Exceptional Violins, Cellos, Double Basses, Bows | Musical Instruments Auction | Skinner | Skinner Inc.
BOSTON, MA – March 17, 2014 – Skinner, Inc., the only American auction house hosting in-person sales of exceptional, high-quality instruments, announces its spring auction of Fine Musical Instruments on April 13, highlighted by the offering of a fine Italian violin, circa 1740, by Dom Nicolaus Amati. More than 300 lots will be featured, including stringed instruments from notable makers such as Landolphi, Gragnani, Rovatti, Baldoni, and De March as well as a selection of fine bows from Peccatte, Hill, and others. The auction also presents a Gibson Les Paul guitar from 1956 and as two Selmer Mark VI saxophones. The auction also features a three “pairs” by a variety of noteworthy modern makers. 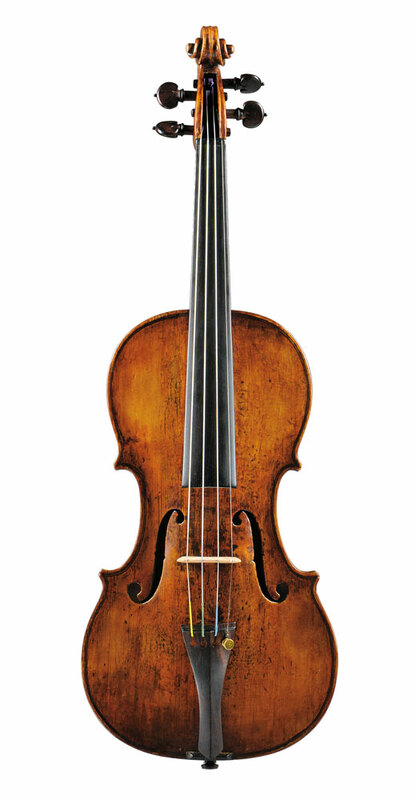 From the hand of Luigi Rovatti, comes a violin from 1923 (lot 22, $18,000 – $22,000) and a violoncello from 1915 (lot 23, $30,000 to $40,000) (ascribed to Rovatti). Also offered are a modern Venetian violin from 1953 (lot 24, $16,000 to $20,000) and viola from 1958 (lot 25, $18,000 to $22,000) by Carlo De March; and two violins by Baldoni, one circa 1918 (lot 27, $12,000 to $16,000) and the other circa 1948 (lot 26, $8,000 to $10,000). The auction will also offer an excellent selection of bows including a Gold-mounted Francois Peccatte Cello Bow with a later frog and adjuster by Isaac Salchow, (Lot 59, $30,000 to $40,000), two W.E. Hill & Sons Gold-mounted Viola Bows, (lot 71, $4,000 to $4,500 & lot 72, $3,500 to $4,000), and two French, Silver-mounted Double Bass Bows with French-style frogs (lots 39 & 40, each $4,000 to $5,000). Skinner is pleased to be able to offer two exceptional double basses in the April auction. 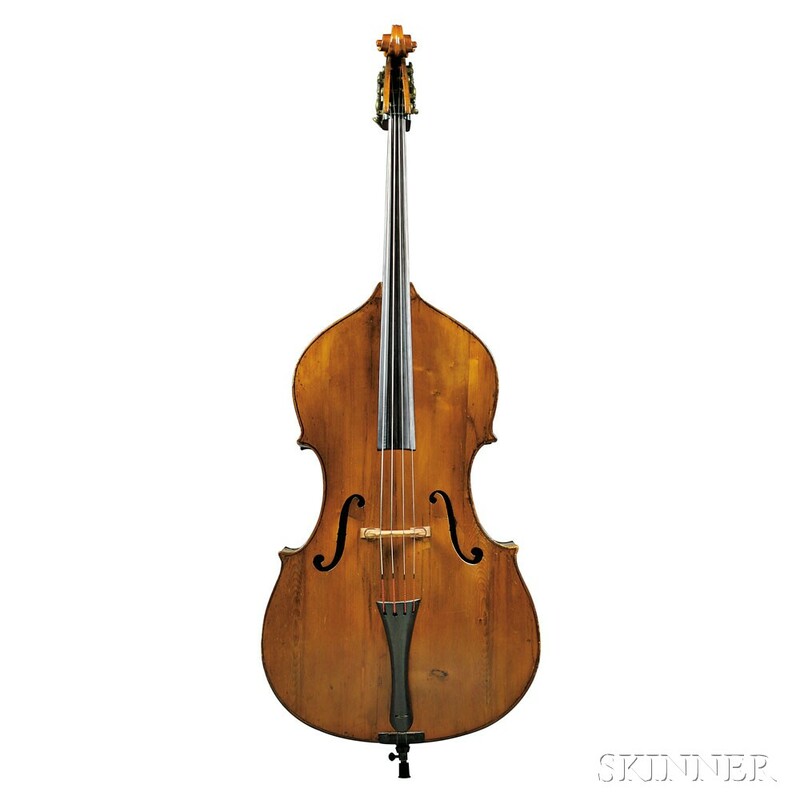 An Italian 7/8-size Double Bass, labeled “…ANTONIUS GRAGNANI, FECIT LIBURNI 17…” (lot 42, $70,000 to $80,000) has elegant proportions and demonstrates clean, elegant workmanship. And a French 7/8-size Double Bass (lot 41, $45,000 to $60,000), ascribed to A. Bernardel from the late 1840s, features a carved lion’s head scroll. “It’s unusual to see such a fine pair of double basses offered in one auction. Both instruments possess extraordinary tonal and playing qualities,” said Jill Arbetter, Department Director. Several highly desirable saxophones will be offered in the April auction. Two Henri Selmer Mark VI tenor models will be sold, one from 1959 bears the serial number 1780212, and the other from 1973 is number 214294 (lots 135 & 136, each $5,000 to $7,000). These saxophones are in excellent condition and come to the auction from a well-known Boston instrumentalist. Also of interest is an American Soprano Saxophone, Conn Mezzo F, circa 1888 – 1893 (lot 134, $4,000 to $6,000). The auction will feature a small, but fine group of guitars and banjos by makers like Fender, Gibson, Vega, and Martin. Highlights include a Fender Telecaster from 1966 (lot 10, $5,000 to $7,000) and a Gibson Les Paul from 1956 (lot 11, $15,000 to $18,000). A fine acoustic guitar by Manual Velazquez from 1965 will also be offered (lot 8, $5,000 to $7,000). Previews for the auction will be held on Friday, April 11 from noon to 7 PM, Saturday, April 12 from 10:30 AM to 5 PM, and Sunday, April 13, from 9 AM to 10 AM. Skinner will present a “Classical Salon” on Saturday, April 12th from 5:30 PM to 7:00 PM featuring the Koritsia Quartet from the Boston University School for the Arts. Illustrated Catalog #2717B is available from the Subscription Department, at 508-970-3240, or from the Gallery. Prices realized will be available online at www.skinnerinc.com, both during and after the sale. The Skinner website enables users to view every lot in the auctions, leave bids, order catalogs and bid live, in real-time, through SkinnerLive! This entry was posted in News and tagged Amati, auction, Baldoni, boston, cello, De March, double bass, Gragnani, guitar, Horst Kloss, Italian violin, Jill Arbetter, Landolphi, music, Musical Instruments, rare guitar, Rovatti, stringed instruments, viola, violin by Skinner. Bookmark the permalink.